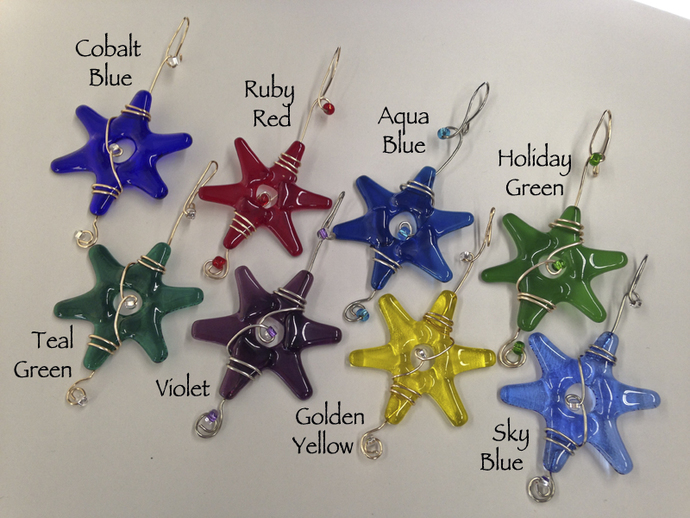 EACH MINI STAR is created with in the colors of the RAINBOW or your choice of 8 additional colors (see attached color chart) wrapped with coordinating wire and embellished with sparkly glass accent beads. Ready to hang in your window or at any time of the year. Use as an ornament on your Christmas tree for the holidays, or as a Hanukkah decoration. Indicate you choice of color in buyers notes when you check out. LOOKING for a DIFFERENT COLOR or SIZE ? - I have STARS in variety of colors: Ruby Red, Aqua Blue, Golden Yellow, Holiday Green, Violet, Cobalt Blue, Teal Green and Iridescent Clear. I make them in 2 sizes and 2 wire colors. Sets of 3 'mini stars' in the same color are only $25. I'll let you know if they are available If certain colors are not currently on hand, I can usually make them and have them ready to mail in less than a week, depending on quantity and availability of the glass color.